摘要 目的 探讨血栓弹力图（TEG）在脑部肿瘤术后凝血功能异常患者临床输血中的应用效果。方法 将38名脑部肿瘤术后凝血功能异常患者随机分为2组：常规检测输血组（对照组）和TEG检测输血组（实验组）,每组各19名。对照组依据凝血4项检测结果,实验组依据TEG的实验数据指导临床输血。对照组血液输注前及输注后24h检测凝血4项,实验组在对照组检测基础上增加TEG检测,观察患者的凝血状况和血液的使用情况。结果 临床输血治疗后2组患者的PT、APTT和TT均有显著缩短（P〈0.01）,FIB显著增加（P〈0.01）。其中,实验组患者的凝血功能异常改善好于常规组（P〈0.05）,实验组患者输注血液前、后TEG检验指标显著改善,差异有统计学意义（P〈0.01）;实验组的CRC和FFP使用量低于常规组（P〈0.05）。结论 TEG和常规检测相比,能更好地指导脑部肿瘤术后凝血功能异常患者的血小板等血液成分的输注。 Objective To investigate the hemostatic effect of Thromboelastography （TEG） for brain tumor patients with coagulation disorders during transfusion and after operation. Methods 38 cases of patients with brain tumors were randomly divided into 2 groups according to various test methods： control group and experimental group. TEG was applied to experi- mental group, whereas the control group followed the traditional guidelines and indicators, including PT, APTT, TT and FIB. Blood samples were collected before and 24-hour after the transfusion for detection. 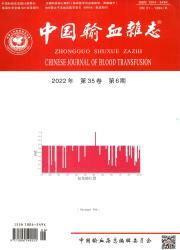 The coagulation conditions of pa- tients and the application of clinical blood transfusion were observed. Results PT, APTT, TT and FIB all significantly im- proved after blood transfusion in both groups （ P 〈 0. 01 ）. In experimental group, PT, APTT and TF significantly shortened and FIB significantly increased. However, the usage of CRC and FFP was minimal in experimental group, when compared to the control. Conclusion TEG provides better galidance and direction for blood component transfusion, in particular platelet transfusion, after operation than the traditional indicators in patients with brain tumor and coagulation disorders.